In the 1960s France, West Germany and Italy started a joint project for a new 500 kg 4x4 amphibious vehicle which became known as the 'Europa-Jeep'. Prototypes were built by two consortia, Fiat/MAN/Saviem and Büssing/Hotchkiss/Lancia. 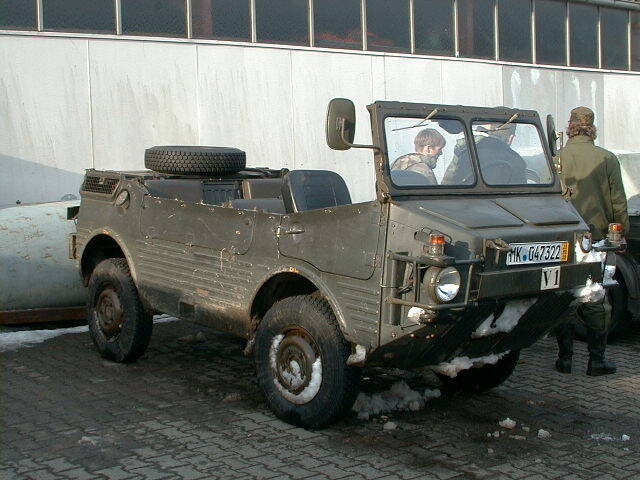 Two German companies, MBB and Glas/BMW, also built lightweight 4x4 amphibious vehicles but none entered production. The project progressed very slowly, and when France subsequently withdrew the project was cancelled in 1976. Only the Italian Army eventually took a number of the amphibious Fiat/MAN/Saviem field cars in service. The 1972 FMS on the left is a rare survivor of the early-1970's experimental and unavailing Fiat-MAN-Saviem amphibious field car project. It is owned by a German collector and is the only known survivor in private hands. Meanwhile, awaiting the arrival of the Europa-Jeep the Bundeswehr (Federal German Army) decided to procure a stop-gap vehicle to replace their ageing DKW Munga. From 1969 onwards Volkswagen built 15,200 Typ 181 Mehrzweckwagen (multi-purpose vehicle) for the Bundeswehr as a temporary substitute. After the cancellation of the Europa-Jeep project the Bundeswehr issued a new requirement for 8,800 4x4 vehicles with a cargo capacity of 500 kg both on and off roads, but this time the amphibious requirement was dropped. Both Daimler-Benz and Volkswagen built prototypes for trials and in 1977 the Volkswagen VW 183 Iltis was selected for production. The first production vehicles were handed over in November 1978. The French Army had invited the French automotive industry to come up with proposals. None of the manufacturers came up with a new design but they all entered 'badge engineered' versions of existing vehicles: Renault proposed their TRM500 (a re-engined Fiat 1107AD Campagnola), Citroën presented their C44 (a modified CX-engined VW Iltis), and Peugeot came up with the P4 (a Steyr-built Mercedes G-series equipped with their own power unit and other components). None of these vehicles was amphibious. In 1981, an order for no less than 15,000 Véhicules Lègers Tous-Terrains was awarded to Peugeot, mainly because of the greater number of P4 variants they could offer. Boschen, Lothar, Das große Buch der Volkswagen Typen. Alle Fahrzeuge von 1934 bis heute. Stuttgart: Motorbuch Verlag, 1983, p.551-555. ISBN 3-87943-799-8. Foss, Christopher F. (ed. ), Jane's Military Vehicles and Ground Support Equipment 1983. Fourth Edition. London: Jane's Publishing Co.Ltd., 1983, p.265. ISBN 0 7106-0766-0. Vanderveen, Bart, 'Auto Union's DKW Munga. The story of a 1950s' German Field Car'. Wheels & Tracks, no. 45, October 1993, p.37. Vanderveen, Bart, 'VLTTs for the French Army: The days of the WWII-type Jeep's active service in France are numbered'. Wheels & Tracks, no. 1, October 1982, p.30-33.